CD4 is perhaps the most crucial target of biomedical research today. Its role spans ground breaking T cell immunotherapy for cancer to HIV to several autoimmune diseases. Also known as T4, and Leu-3, CD4 is a 55 kDa type I transmembrane glycoprotein and member of the immunoglobulin superfamily. Primarily described as a marker for T cell subsets it can also be found on NKT cells, innate lymphoid cells and macrophages. It acts as a facilitator of the interaction between T cell receptor and the MHC/antigen complex on antigen presenting cells. It is this interaction that leads to T cell activation and also forms the basis of some T cell therapies against cancer. CD4 forms part of the T cell receptor complex that binds to the beta 2 domain of the MHC molecule leading to activation of pathways downstream of the T cell receptor. Anti-CD4 monoclonal antibodies can also induce CD4 internalization which reduces overall CD4/MHC class II interactions, resulting in reduced T cell activation. CD4 is also a receptor for IL-16 (IL-16 stimulates migration response in CD4+ T cells and monocytes and induces CD4+ T cells to respond to IL-2 and IL-15) and a co-receptor for HIV and human herpes 7. Our CD4 antibody range can be viewed here. Below we look at anti-CD4 clones and their recommended applications. Clone RPA-T4 antibody recognizes an epitope within domain 1, of the extracellular region, of the CD4 molecule. Clone RPA-T4 has been reported to block T cell activation and HIV binding, it also prevents gp120-CD4 interaction and inhibits syncytium formation. Applications for this antibody include flow cytometry, immunohistochemistry - frozen and functional assays. Clone OKT4 antibody recognizes a different epitope than the RPA-T4 clone antibody; it binds to the D3 domain of CD4 and does not prevent HIV binding. Neither of these antibodies blocks binding to each other's respective epitopes. Clone OKT4 antibody is recommended for use in flow cytometry and immunohistochemistry – frozen. Clone YNB46.1.8 antibody blocks syncytia formation of U937 cells infected with HIV. Applications for this antibody include flow cytometry and immunohistochemistry – frozen. 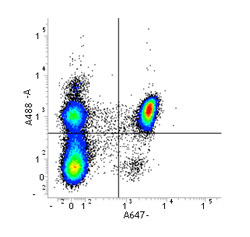 Clone 7E14 antibody is recommended for use in flow cytometry. Clone 1F6 antibody is recommended for use in immunofluorescence, immunohistochemistry – paraffin section and western blotting. 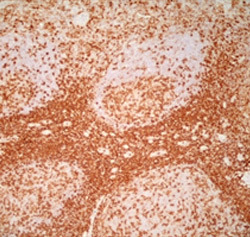 Clone 4B12 antibody is recommended for use in immunohistochemistry – paraffin section. Clone A161A1 antibody is recommended for use in for use in flow cytometry. Clone N1UG0 antibody is recommended for use human formalin-fixed paraffin embedded tissue sections. Clone RM4-5 antibody blocks the binding of GK1.5 antibody and H129.19 antibody to CD4+ T cells, it is useful for in vitro blocking of ligand binding, as well as in vitro CD4+ T cell depletions. Clone RM4-5 antibody is recommended for use in flow cytometry and immunohistochemistry – frozen, but not for immunohistochemistry of formalin-fixed paraffin sections. Clone GK1.5 antibody has been reported to block CD4+ T cell activation. It blocks class II MHC antigen-specific binding, thereby inhibiting functions such as class II MHC antigen-specific proliferation and the release of lymphokines. It may also be used for in vivo and in vitro cell depletion of CD4+ T cells. Clone GK1.5 antibody is recommended for use in flow cytometry, ELISA, immunohistochemistry – frozen, immunofluorescence, functional assays, immunoprecipitation and western blotting. Clone YTS177.9 antibody blocks MHC-II dependant T cell responses in vitro and in vivo and induces tolerance. Recommended applications include flow cytometry and functional assays. Clone YTS191.1 antibody exhibits depleting activity when used in vivo. Recommended applications include flow cytometry, immunohistochemistry – frozen and functional assays. 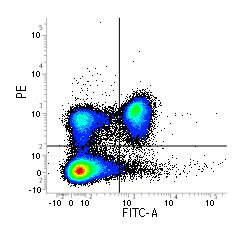 Clone KT174 antibody is recommended for use in flow cytometry. Clone 4SM95 antibody is not recommended for immunohistochemistry of frozen mouse tissue.